900 words / 5 min. 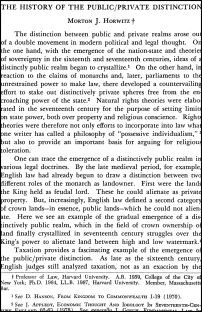 According to Horwitz, public law is constitutional, criminal, and regulatory law, while private law covers torts, contracts, property, and commercial law. Second, contracts became increasingly understood as purely private matters between “consenting individuals in which the state should have no interest.” This limited doctrines in equity that protected against, for example, unfair contracts based on unequal bargaining positions, etc.7 This laid the groundwork for the emergence of “liberty of contract,” as in the (in)famous Lochner v. New York decision from 1905. To put it differently, the growing gap between the wealthy and the poor during the Gilded Age, which was generating attackes from Populists, Progressives, workers, farmers, and the rest of the “majority,” required new legal doctrines to protect and preserve it. Otherwise, the majority might well rise up and redistribute the wealth more fairly and equally. But is private power really different from public power?